Disability in old age is known to be greater among Hispanic immigrants than US-born populations. However, little is known about immigrant disability at younger ages. Using ACS data, Mara Getz Sheftel and Frank W. Heiland show that foreign-born Mexicans have lower disability rates than non-Hispanic whites at working ages, but this health advantage reverses around retirement age. In a recent study (Sheftel and Heiland 2018), we examined immigrant-native disability patterns by age in the United States. We focused on Hispanic immigrants, and foreign-born Mexicans in particular, who constitute the largest immigrant group in the US. Prior research suggests that Hispanic immigrants aged 60 and older are more likely to have a disability than US-born populations. However, relatively little was known about immigrant disability at younger ages. The objective of our study was to document age-specific patterns of disability prevalence. Specifically, we investigated whether Hispanic immigrants have lower disability rates in mid-life and, if so, given the prior evidence on their greater disability in old age, at what ages this advantage reverses. We were also interested in identifying potential correlates of this pattern, such as how it differs by gender, age at immigration and socio-economic status. Our study examined a large sample based on nationally representative data from the American Community Survey (ACS) 2010-2014. We constructed a binary measure of overall (“any”) disability based on individuals’ responses to six questions regarding different disability domains: hearing, vision, cognitive, ambulatory, self-care and independent living difficulties. To estimate age-specific rates of disability for various groups, the individual-level data was aggregated by one-year age groups using ACS-provided person weights. In addition to overall disability prevalence rates, we also obtained results from separate analyses of the six underlying disability domains. Our sample included almost 6.6 million US-born non-Hispanic whites, blacks, individuals of Mexican origin and Hispanics (non-Mexican origin) as well as foreign-born Mexicans and Hispanics (non-Mexican born). The average age was 56.5 years and 24.4% of the sample was over the age of 65. The sample was 48.4% male and 91.7% US-born. Of the individuals in the sample, almost 300,000 were foreign-born Mexicans, who were younger than the overall sample, with a mean age of 51.9 years; 12.9% were over the age of 65. We estimated age-specific disability prevalence rates by gender, nativity, education and migration age from age 40 to 80. Figures 1 and 2 show disability prevalence rates (“overall disability”) by gender for five key demographic groups: US-born non-Hispanic whites, US-born non-Hispanic blacks, US-born of Mexican origin, foreign-born Mexicans, foreign-born Hispanics (non-Mexican). Among both males and females, foreign-born Mexicans have the lowest rates of disability. However, their advantage starts to decline as they age and reverses in old age. For example, at age 45, the overall disability rates for foreign-born Mexican males and females are 5.8% and 6.3%, respectively, compared to 11.1% for the US-born population. In contrast, 45.5% of Mexican-born males report having a disability at age 75 compared to 36.3% for US-born males. For Mexican-born females at this age the rate is even greater at 49.8%, which compares to 36.3% for US-born females. 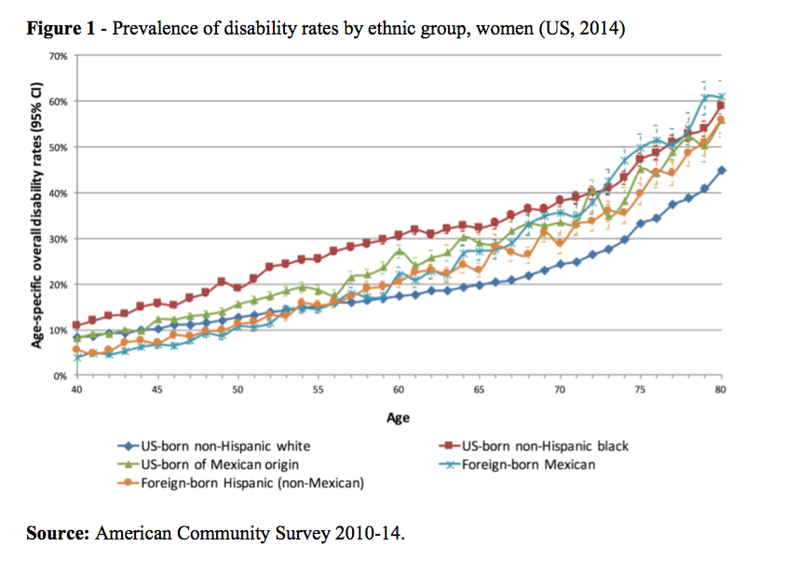 As shown in Figure 1, the advantage in terms of lower disability prevalence among foreign-born Mexican females compared to US-born non-Hispanic white females at prime working ages ends at age 53; after age 59, the rates for foreign-born Mexican females are significantly greater. While there is no exact “crossover” age, the pattern reverses between ages 52 and 60. 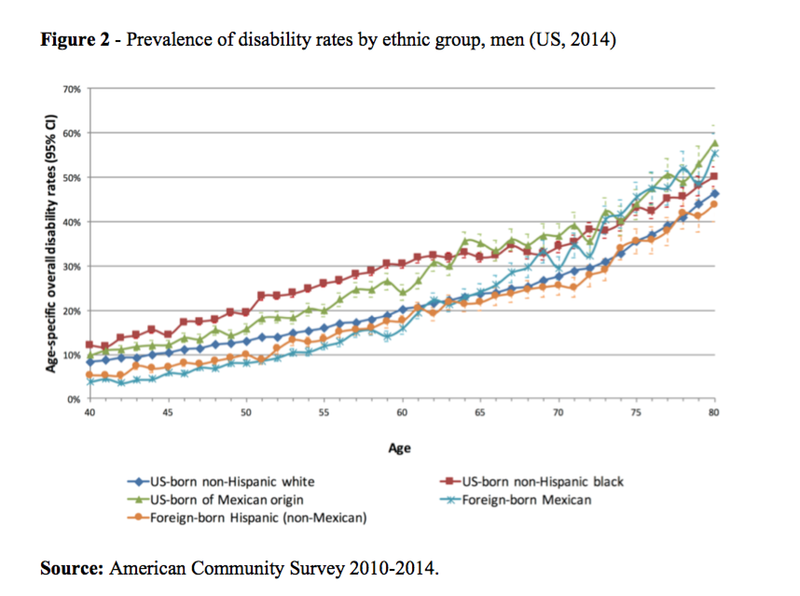 Among foreign-born Mexican and US-born non-Hispanic white men, a similar reversal of the disability advantage occurs between ages 60 and 66 (Figure 2). Similar patterns hold for other foreign-born Hispanics. 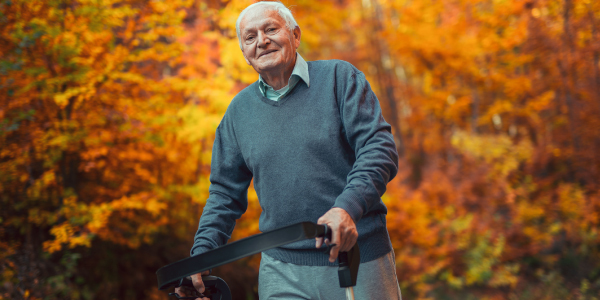 Although not reported here, similar patterns of reversal (crossovers) occur also in rates of specific disabilities, such as ambulatory, cognitive, independent living, and self-care. We also examined immigrant disability rates by educational attainment and age at immigration. Evidence of a steeper age-disability gradient among less-educated immigrants was found, but there were only minimal differences by age at immigration. Mexican immigrants of both sexes have lower disability rates at working ages than US-born non-Hispanic whites, but this health advantage starts to reverse around traditional retirement ages and in old age Mexican immigrants are more likely to be disabled. The deterioration of a broad range of health outcomes among immigrants has been observed in other immigrant receiving countries as well (see Lassetter and Callister 2008 for a review of this evidence). To the extent possible, we examined behavioral and environmental explanations. The acculturation hypothesis from the Hispanic health paradox literature posits that higher acculturation, measured by time in the US, is associated with increased unhealthy behavior and worse health status (Abraido-Lanza, Chao, and Florez 2005; Antecol and Bedard 2006). These behaviors may lead to poorer health and, over time, higher risk of disability (Hayward et al 2014; Verbrugge and Jette 1994). However, in light of only minimal differences in disability by age at immigration, we dismissed acculturation-related behavioral explanations for the reversal. Our findings by educational attainment, on the other hand, are consistent with the hypothesis that the concentration of Mexican immigrants in high risk occupations may be a driver of the reversal. Our study was primarily descriptive, and the cross-sectional nature of the data limited our ability to rule out certain explanations and quantify the contribution of specific mechanisms. However, we considered several explanations for the reversal of the health advantage in disability from working to old age. We discussed the possibility that it is an artifact of compositional/selection effects or (other) data quality issues. Further research would compare our results to disability rates of Mexicans remaining in Mexico. This would help to determine if this is a trajectory common among those of Mexican origin or if a healthy immigrant selection effect (Jasso and Massey 2004) is operating here which decays over time with the cumulative effect of lower SES (House et al 2004) and riskier work conditions (Orrenius and Zavodny 2009). In addition, evidence from representative long-term (life-course) studies of immigrant cohorts is needed. This would require the collection of longitudinal data following Mexican immigrants over time. Until such data are available, more attention should be paid to the health and work experiences of this growing population.